Dad’s ministry promotion flyer to pastor’s from the 1980’s & 1990’s. No one has influenced my faith more that my #1 Hero, my Dad, Evangelist Carl Brandenburg. There are not enough words in the English language to describe the wonderful influence and convicting example Dad has been to me. He and Mom are the best Christians I have ever known. Mom was a missionary nurse before meeting and marrying dad. Dad was called to preach and was licensed into the ministry in 1950. Dad has been a magician since he was 13 years old. 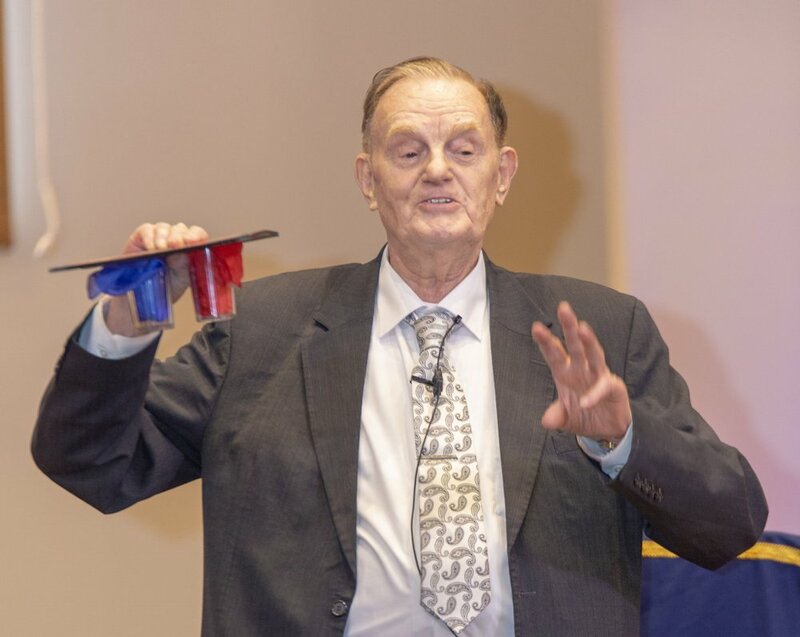 He had gotten away from the ministry for many years and then in July of 1968 he rededicated his life to the Lord and was led of God to begin using his talent in the art of magic (illusions) to present the Gospel. Mom and dad helped to start the children’s church at the Troy Baptist Temple of Troy, Ohio where I grew up. They also began to conduct several Good News Clubs per week to reach more children with the Gospel. "Magic with a Message" is the name Evangelist Carl Brandenburg gave to his method of presenting the Gospel with sleight of hand tricks, commonly called "magic." Watch as he uses his talent as a magician to capture the attention of children of all ages and then present them with Biblical truth. I watched my Dad get up very early every morning, spend time reading his Bible and pray before going to work at B.F. Goodrich. He would get off work every day at 3:00 PM, and would be home by 3:15 PM, shower, change clothes, we would have supper, and then the family would get into the car and drive to a church to do a Children’s Revival service. (Dad called them, “Kid’s Krusades.”) We would drive home after the service. I, along with dad, my brother, and my sister would go to bed, and mom would go to work as a nurse throughout the night while we slept. The next day we would do it again. Even in this busy schedule they stayed faithful to our home church, were consistent in their personal walk with God, Dad did correspondence Bible college work from three different Bible colleges, including completing the “Liberty Home Bible Institute” curriculum. Mom went to Heaven on April 1, 2016. Dad is 85 years old. He misses mom, but still wants to do something for God. At the bottom of this page is a video of Dad presenting “Magic with a Message” at Faith Baptist Church in Warren, Michigan on November 4, 2018. Dad served as a children's evangelist for over 35 years, beginning in 1968. He retired several years ago and this is his first time "back in the saddle" again after many years. I was saved during one of Dad's children's revival meetings in 1972 in Piqua, Ohio. Many of you have heard me talk about him for years, now see for yourself how God has used him. My Mom went to Heaven on April 1, 2016. They were married for 57 years and was his constant companion. Dad is not able to drive himself to meetings any longer, but would like to get back to doing programs in churches. We are praying for a young man who is interested in ministry to be Dad's traveling companion to drive him to churches where he would give the "Magic With a Message" program. He lives near Dayton, Ohio. Please contact me directly if you are interested.